The stated aim of our work is to achieve a lasting increase in our client’s profits. The prerequisites for our work are an in-depth understanding of the legal systems of the various countries we work in, coupled with the ability to effectively control a network of experts to strengthen our negotiation position and prepare cases for litigation were appropriate. An emphasis on quality, including legal expertise and management of processes. Our quality management system ensures legally sound and optimised claims handling. Experienced teams of specialists help you to minimise costs in complex, expensive claims. Our Fraud prevention system integrated in our case management system (THEMIS) helps prevent and prosecute fraudulent claimants. Our work principles are based on the analysis of Processes and data. 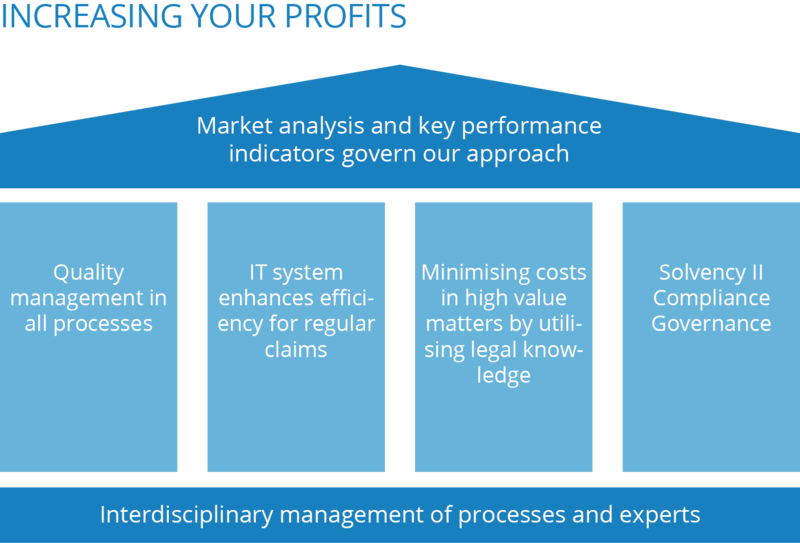 We break down individual steps to allow us to measure and compare them, to optimise each process of the claims handling chain. This allows us to offer you the optimal performance at competitive pricing.